Periodontist Dr. Lindsay B. Eastman can now offer pregnant women a new way to reduce their risk of pre-term or low-birth weight babies by treating gum disease with a new laser gum surgery. The Laser Assisted New Attachment Procedure (LANAP) effectively combats periodontal disease in less invasive ways, in less time and with fast-healing results. Dr. Lindsay Eastman now performs laser gum surgery for his Bradenton patients. Dr. Lindsay B. Eastman is among the leading periodontists to regularly perform the FDA-cleared laser gum surgery that has been shown to deliver superior results in the fight against gum disease. For pregnant women, the gum disease risks include premature births or babies with low birth weights. The ability to combat periodontal disease with the Laser Assisted New Attachment Procedure (LANAP) gives pregnant women a new opportunity to reduce such risks. Gum disease is essentially a bacterial infection in the gum tissue. Any infection in the body is able to spread and, for a pregnant woman, that means to her baby as well. During pregnancy, a woman’s entire body changes, including her mouth tissue. It is not uncommon for a woman to develop gingivitis, the early stage of periodontitis, in the first trimester of pregnancy. Treating the gingivitis at this point is the best way to minimize associated risks to both mother and baby. LANAP uses the PerioLase® MVP-7™ laser to target diseased tissue and absorb it. All healthy gum tissue is left unaffected and the laser can be used after the application of only a mild local anesthetic. Traditional gum disease treatments required that patients have a full anesthetic prior to the scalpel being used to cut away tissue in the diseased area. This new laser gum surgery eliminates the need for sutures. Having an option to treat periodontal disease in a less invasive way is important and helpful for all patients, and can be especially advantageous to pregnant women concerned about undergoing additional procedures while pregnant. Just as with eating properly, taking proper care of a pregnant mother’s gums and oral health is another way to take care of her baby. Dr. Eastman has chosen to adopt LANAP laser gum surgery for its benefits to patients from process to results. To learn more about LANAP and how it can help you, visit Dr. Eastman’s website at http://www.eastmanonline.com or call his office today. Lindsay B. Eastman, DDS, MS, PA is a periodontist offering patients personalized dental care in Bradenton, FL since 1980. Dr. Eastman received his Doctor of Dental Surgery degree from Loyola University Dental School where he completed his Graduate training in Periodontics and his Masters of Science in Oral Biology. He received his Post-Graduate specialty training in Surgical Placement of Implants from Northwestern University Dental School, and completed Business Management Training from Pride Institute. He is part of one percent of dental professionals providing the most recent FDA cleared laser procedure for gum disease and periodontal treatment. 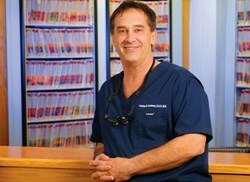 To learn more about Dr. Eastman and his dental services visit his website at http://www.eastmanonline.com and call (941) 792-3899.